Posted by M Bharath Bhushan in Adilabad, Andhrapreneurship, Banjara, Bhadrachalam, Chenchu, Culture, Economy, elections, Godavari, Guntur, heritage, Koya, Lambada, Mahabubnagar, Nalgonda, Polavaram, politics, Rangareddy, regionalism, Settler, ST, Telangana. New dists to check Telangana state demand? GUNTUR: Opening a Pandora’s box, the Congress government is working on redesigning of districts in the state. 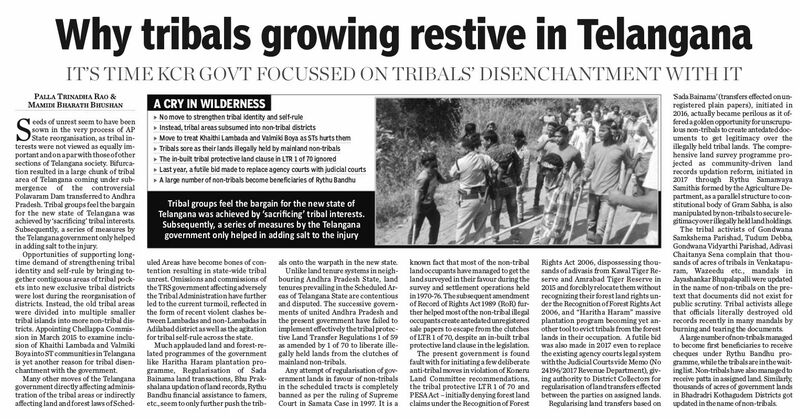 Though the government claims that it is being done taking in view of the serious imbalances in the development of rural areas, analysts believe the new agenda is being thrust on the political stage only to counter the separate Telangana statehood issue. Sources said the study paper is likely to advocate formation of at least eight to 10 new districts in the state. “Even small states like Orissa and Karnataka have more districts than AP. Creation of new districts is the only solution to overcome underdevelopment,” the minister argued. After taking over the reins of the rural development ministry, he started an exercise in checking imbalances in the flow of funds and their reach. He discussed the issue with chief minister N Kiran Kumar Reddy and secured his permission for making the study on creation of new districts. Posted by Telangana Utsav in agitation, Chenchu, Culture, fast, Identity, Mahabubnagar, politics, regionalism, ST, students, Telangana, youth. MAHABUBNAGAR: Palle-Palleku Telangana programme was taken up in the district by pro-Telangana activists on Sunday. The programme began with the Minister for Small Scale Industries D.K. Aruna flagging a huge motor cycle rally at Gadwal town in the district. Under the programme the Telangana activists will explain to the people in the villages about the necessity of separate Telangana. To express their protest Telangana activists have prepared food and had community lunch on the road near Kothakota town in the district. Posted by Telangana Utsav in agitation, BCs, Chenchu, Congress, Culture, G.O 610, Gond, Hyderabad, Identity, KCR, Koya, Lambada, MIM, Mulki, Muslim, politics, Rayalaseema, SC, Sonia, ST, Telangana, Telugu, TRS, universities, Y S Jagan, youth. HYDERABAD: Even as Telangana – the scene of protests, vandalism and fasts for a separate state about eight days ago – has gone silent, some say that it is only a lull before the storm. “We will restart the agitation the moment we get an impression that the central government is trying to go back on its promise,” a student leader said. He admitted that the central government going on the backfoot was a possibility considering the din intensifying for Samaikhya Andhra in Coastal Andhra and Rayalaseema regions. “The T-movement is about to erupt again. People here are shocked at the way the upper castes in coastal Andhra are trying to stop the creation of Telangana. The coming days will be volatile and decisive,” Madan Mohan, joint action committee (JAC) leader in Warangal told TOI.